The Nova Vodolha police arrives now twice as times faster when concerned citizens call the hotline 102: This is one of the inital results of the Nova Vodolaha police pilot project in Kharkiv region. The project was supported by EUAM in close coordination with the main department of the Ministry of Internal Affairs there. 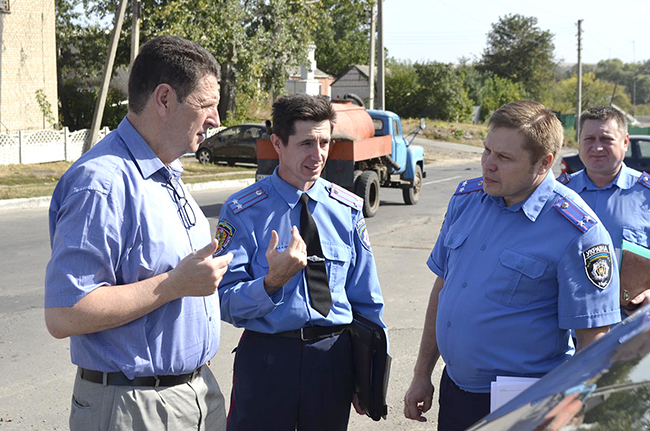 Experts from EUAM recently visited the city for an assessment. The project was created not only to regain trust of the public, but to update and improve public order approaches and to have a more visible police presence. Despite of some skepticism and preconceptions by local citizens and officials, the pilot project disproved all it. It met the expectations by both the EUAM and the Kharkiv region police. “I am very satisfied with the level of professionalism of both the regional and station commander how the new model of police station is implemented in Nova Vodolaha,” stated Udo Moeller, Head of the EUAM Regional Outreach. Representatives of EUAM and the regional police met also together with the Nova Vodolaha district administration and local activists of the civil society and assessed the implementation of the Nova Vodolaha pilot project. “In a meeting with members of the Nova Vodolaha NGOs, they announced their satisfaction with the project but also demanded continuously relevant public information about the project implementation and generally about the public security in Nova Vodolaha district,” said Udo Moeller. He also expressed the need to have regular follow-up meetings between the civil society and police. The NGOs mentioned that the police is not reaching out sufficiently to the younger generation in Nova Vodolaha. It was agreed that the next public meeting of the district police chief will be held with the local youth. The implementation of the Nova Vodolaha project (so called “copy” of the joint EUAM police station project in Sambir) was ordered by the Minister of Interior, Arsen Avakov, and launched on August 18, 2015.